The Dahlia and Amara Ring Set is the symbol of the spark of love. Shown in 18k Yellow Gold, with a centre diamond of 0.65ct, Round Brilliant Cut, E/F Colour, SI1 Clarity. Set with 8 brilliant cut diamonds 1.25ct. 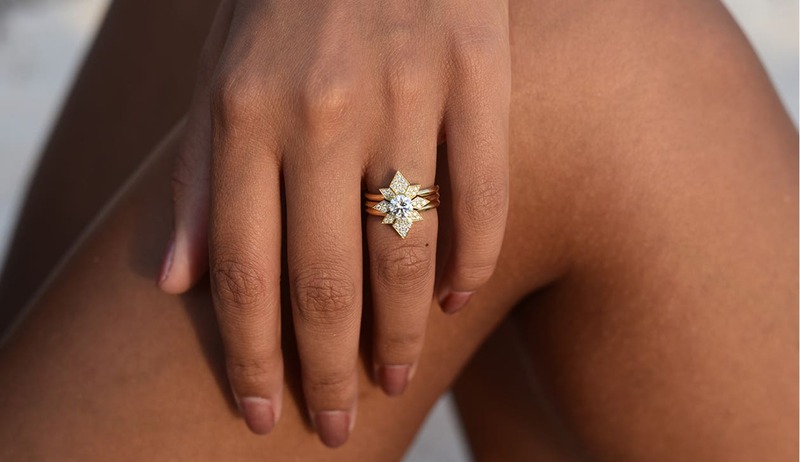 The Dahlia Engagement Ring fits perfectly inside the Amara Wedding Bands. The Dahlia Engagement ring is the symbol of the spark of love. It unites in harmony with the Amara Wedding bands to create to a radiant geometrical shape with the solitaire diamond shining brightly from within. The setting can be made from 18k white gold to enhance the brightness of the diamonds, completed by the warm 18k Yellow gold band. We can alter this design to suit you, choose from Platinum, Yellow, White or Rose Gold. We like nothing better than working with you to create something truly special.